discuss the future of manufacturing in New Mexico. Albuquerque Business First and New Mexico MEP sat down with two New Mexico companies and explored future opportunities for manufacturing in New Mexico. Industry 4.0 involves a range of new technologies that are fusing the physical, digital, and biological worlds. New Mexico manufacturers exported more than $3.65 billion in goods and services in 2015. Celebrate the power of manufacturing in New Mexico. Join the tours, bring a student! Glass Rite, OGB Architectural Millwork, Unirac, Urban Fresh Cosmetics, Insight Lighting, Aquila, Valencia Flour Mill, Jack’s Plastic Welding, Pesco, Mesa Photonics, Solaro Energy and Santa Fe Business Incubator companies were among the 33 businesses that hosted Manufacturing Day tours in New Mexico. 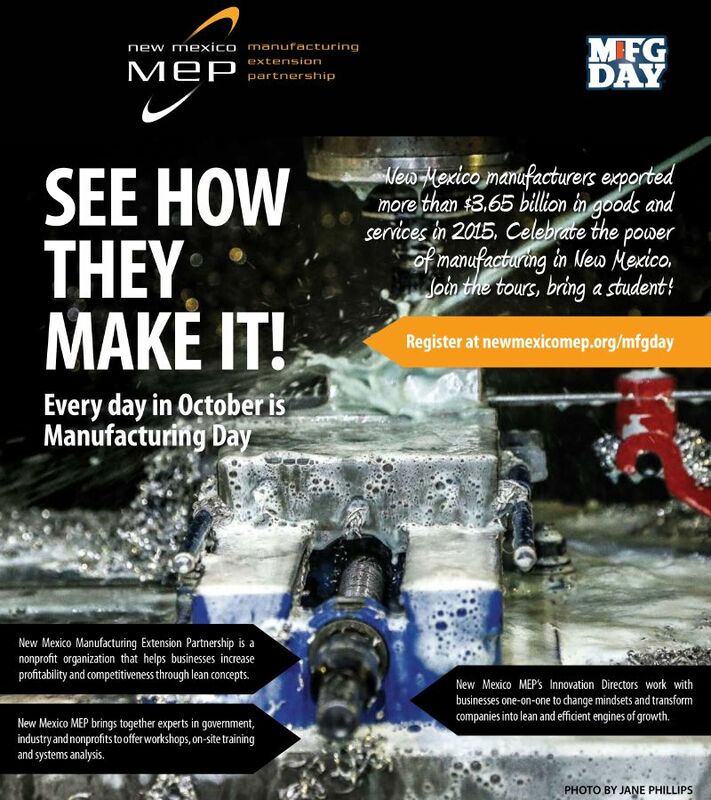 Thirty-seven New Mexico companies held Manufacturing Day tours in 2014. The impact of manufacturing on America can be seen in the good jobs it provides, the strength of the economy, and the products built in communities around the nation that enable and enrich our everyday lives. We celebrate manufacturing’s impact and the MEP centers across the country working alongside small and medium-sized manufacturers to make an impact on their people and operations.